Here are a series of pictures submitted by fellow crow hunters that show strange, bizarre and exceptional crows. Please include your name, and a brief description of the circumstances that lead to the picture. Note: Please send a copy of your photo, we are not able to return any photos. Thanks. You DO NOT have to be a member to submit a picture to this page. Zach Wood of Chisago City, Minnesota took this white-winged crow after a fluke misfire caused him to skip the bird ahead of this one. This white winged crow was taken by Kenny King (the Iowa Crow King). What was even more amazing was that he took an identical crow 5 minutes later. Kenny has taken five piebalds since he started guiding crow hunters. This brown winged Fish Crow was taken by a member of a hunting party under Jerry Tomlin on the 12th of December, 1999 in Eastman, GA. This white winged crow was taken by Chris Heinbockel of Mt. Sinai, NY on Feb 12th, 2000. What a trophy! Ole "One-Toe" was taken by Jerry Tomlin of the Crow Roost in November of 1998. This chocolate brown crow was taken by Crow Staff Advisor Bob Aronsohn of Hutchinson, Kansas. This is a one-in-a-million trophy. Another trophy submitted by Crow Staff Advisor Bob Aronsohn of Hutchinson, Kansas. Bob has managed to take 24 piebald crows in his life. "White Stripe" submitted by Danny Williams of Perry, OK. Rifle's nice too. Crow Staff Advisor Bob Aronsohn submitted his picture of a nearly white crow taken in Missouri by Jack Utterback Sr. in the 60's. This rare beauty is actually not a true albino since both it's feet and beak are brown. Wow!! Robert Whipple submitted this picture of a strange looking crow he saw near his home in Oregon, Illinois. Several friends tried to get him to call this one and another similar crow in to be shot, but Bob never got around to it. Too bad, what a mount this beauty would have made! This Piebald crow was taken by Crow Busters founders Gordon Krause and Doug Wigfield. Doug and Gordon both fired at the same time and naturally they are both taking credit. 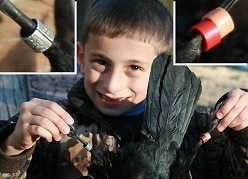 Member John Consolini of Washington state recently took this banded crow. 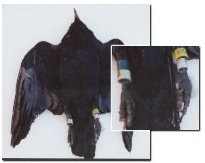 The bird appears to have been banded more than once and is obviously a very old bird. It's feet were callused and had odd "hair" growing from them. Last we heard, John is still waiting for an answer from the Dept. of Agriculture about this strange bird's history. Ben Browning sent in these pictures of this absolutely incredible bird. He said that he specifically hunted this crow for 3 weeks before getting a shot. He also said that he wasn't sure why, but this bird was the most aggressive in the group. 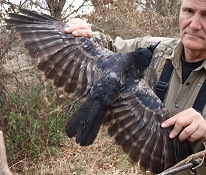 Connecticut Member Gary DiMarco's first crow was this strange billed bird. It's hard to imagine how this crow survived as long as it did. 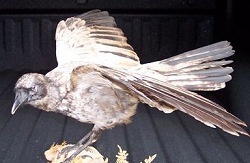 Bill (crowshot) Sembler shot this brown crow in March of 1997. What can we say? We can only hope he got a chance to pass along those unique genes before Bill had him mounted. Robert Podlesnik shot this incredibly unusual crow in southwestern PA in 1997. The crow changes from light grey to silver grey toward the tail. The only black on the bird is its beak and feet. This is sure one for the record book! Michael Pajonk shot this odd crow in southern New York in January of 2002. Note the bony protrusions throughout the foot. Wierd! A friend of member Larry Liebsch took this odd crow and then had it mounted. No doubt! Bjorn Backeby of Sweden managed to take this double oddity (at least as far as we are concerned here in the U.S.). While he regularly shoots the common Greyback crow, this is the first piebald he has ever seen. Certainly a trophy on any continent. Donnie Martin took this exceptional white winged piebald near Mt. Vernon Indiana. 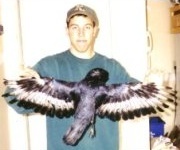 Member Jim Ligda took this crow on the opening day of the 2001 crow season in Indiana. After turning on his e-caller, he was surprised to see this crow hitting every branch on his way to the call. After he shot, he found that the crow had growths coming completely out of each eye and was completely blind. That says a lot about the survivability of the common crow. Member Butch Jefferson took this nice piebald on the last morning of his season in Georgia. This was the second he took this year. 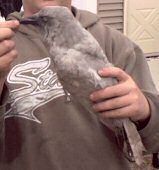 Jason Anderson of Parker, South Dakota shot this super rare crow in central South Dakota on 10/15/03 during an annual crow hunt that has been conducted every year since 1917. This "Peg-Leg" crow was shot by Dan Sherwood in NY. Dan thinks that the crow was born this way, but it may have also resulted from an old injury. In either case, it sure would make it difficult for this crow to roost at night during a strong wind!! Amazingly, this pair of piebald crows was taken by Dan Sherwood and Tom Guditis of NY less than two hours apart on the same shoot. Hey Dan, do you think you could save a few for the rest of us? Long time member Drew Moore took this strange piebald crow during a recent "Crow Safari" with Staff Advisor Bob Aronsohn. Note the black wing tips and Brown/Grey body. Strange! Kris Brantner recently shot this grey crow on public land in Western Wisconsin. He first saw it with a spotting scope about 1/4 mile away and thought it was a gull. Once he realized what it was, he successfully called it within range. He says he intends on getting it mounted. I'll bet! 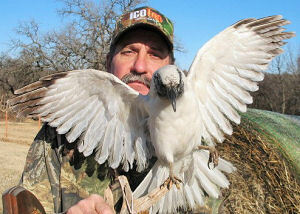 Stanley Wilson took this rare white/black piebald crow a few years ago in Oklahoma. 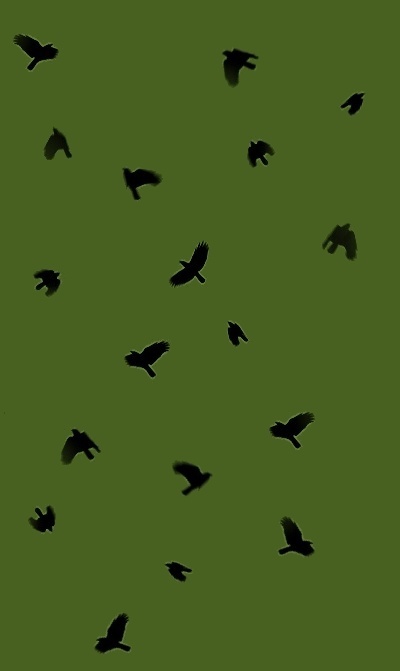 So fellow crow hunters, as they said in the 1950's movie "The Thing", "Watch the skies..."! Walter Vessey, while hunting crows near Charlottetown, Prince Edward Island, Canada, shot this nice piebald crow. He says he has been hunting crows for about 25 years and has never seen another crow like it. Just call it luck Walter! Gary Hoffacker was run and gun hunting in Western Pennsylvania when this crow came in with two black crows. He shot both of the black crows and then noticed the white one and was in such awe that he didn't even shoot it. It circled his friends head 3 times, heard Gary's hand calling and then flew straight back over the decoys into gun range. Hey Gary, we understand how you felt. We are also in "awe" after seeing this fine trophy. Here is the mounted result of Don Peterson’s oddity taken in October of 2000 near Deerfield, WI. Until recently Don thought his non-black crow was unique. Well Don, there are other piebalds around, but yours is certainly unique and a great trophy! This piebald was shot by member Mike Carr during a field setup hunt in New Jersey in 2008. Note the crow with a piece of bread in his mouth shot the same day. Nice bit of luck Mike. This photo was submitted by Paul Jordan of Lebanon County, Pennsylvania during a heavy snow in 2008. After his first thought that it was a pigeon, he quickly realized that pigeons and crows are not flying buddies. He said "I haven't been that excited since the Christmas of 1965!". Hey you guys from PA, he might still be out there! Our very own Bob Aronsohn took what only can be described as an oddity among oddities this fall of 2009. He informs us that this one will definitely make it to the Aronsohn "Crow Museum". Bob, it's nice to know that you can still amaze us! Robert Wigton shot this banded crow that had one metal band and two plastic bands that were different colors on the opposite leg. He is still looking to find out the unique history behind these bands. this crow actually landed in the tree he had some of his decoys in. Big mistake! Robert Frost of Guin, Alabama took this fantastic piebauld on a crow hunt using a Johnny Stewart caller and a Benelli Super-90 12 gauge. He says that he has been hunting crows for about 50 years and this is the only piebald that he has ever seen. 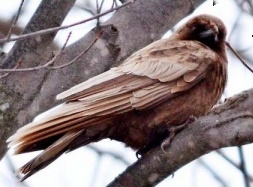 This brown crow was spotted in Bruce County, Ontario Canada, on 16 Feb 2013. by Herman A. Roote. Glad you had a camera Herman. Bet you wish you also had a shotgun! Another beautiful piebald crow taken back in the 80's by our very own Bob Aronsohn. A nice addition to the Aronsohn museum as can be seen in the background. Greg Smith took this amazing bird one morning in his local area in Mississippi. This was bird #34 of the morning and was so odd that his kids thought it was a hawk. Amazing and simply a "once in a lifetime" trophy! This crow was shot in Ohio in December of 2014 by Max Williams. He says that this was his first piebald. Nice start! Stephen Yoho shot this amazing black wing tipped white crow in October of 2013 at his house in the Raccoon Township of PA. At first he though it might be a hawk, but once it squawked he brought it down. Quick thinking and a beautiful trophy! This one-in-a-million bird was taken by Doug Markwell in central Illinois in December of 2014 during a successful crow shoot of 80 total birds. 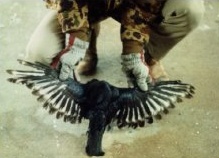 This bird was shot with his very last shell and was also number 80. Doug, you must have appeased the hunting gods that day! Here is another piebald crow taken by our very own Bob Aronsohn in December of 2014, According to Bob, this is his 38th oddity in 41 seasons with a total of 153,565 birds. That comes to one oddity per 4,041 birds. Persistence does pay off! This nice piebald was taken by member Mike Rawlings in a feedlot in Wyoming. Using his trusty 870 Wingmaster Mike, says that he nearly screwed himself into the ground trying to get the shot off at this bird. We understand completely Mike, these rare birds are tough to find! Bruce Hansbrough took this gorgeous white crow in Stafford County, VA early this year (2015). Not many crows can render us speechless, but this one did. Congrats! This banded crow was taken on January 27th, 2015 by our very own Bob Aronsohn. It was banded on June 11th, 2014 in Kyle, Saskatchewan. He flew over 1,000 miles to be shot by a "Living Legend", a fitting end for any crow. After chasing after a white winged crow for over ten years Eric Paynter got two in one day just outside Summerside, PEI Canada!! This one is nicer than the other but he said that he isn't complaining. This amazing crow was killed by Karl Roberge in September of 2015 in Quebec, Canada. Not just a beautiful crow, but a beautiful mount as well. This one-in-million brown phase crow was shot by no other than Crow Busters staff advisor Skip Woody. Skip says that this bird was taken at 9am, 22 miles from his house in Chapel Hill N.C. using a 12 ga., # 71/2 Rem. Nitro 27 load with an IC choke. We are told it went straight to the taxidermist of course! Paul Shakula shot this amazing white crow in Logan county Oklahoma in December of 1999. After seeing it several times feeding with some black crows, he waited for an opportunity. which came a couple of months later. Persistence does pay off! Copyright (c) 1999. Crow Busters. All rights reserved.